Mr. E. C. Spitler may truthfully be classed among the successful merchants of London. 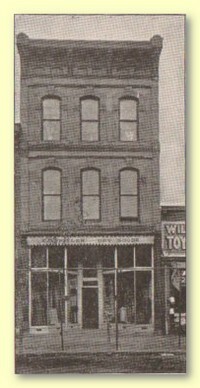 He purchased the business in its present location on Main street in April, 1903. He occupies the entire building in which are three floors; making a total of nerlay seven thousand square feet. Th efirst floor is used to display the fine assortment of dry goods, notions, ladies' waists, fancy and art goods. On the second floor is a large sales and display room devoted to ladies' suits and ready-to-wear garments, while another part is used for rugs and wall paper. The collection of rugs is particularly noticeable, and for variety, beauty and quality — seldom seen in a city of this size. The third floor is entirely devoted to carpets and matting, and here is a large stock in all grades and nearly all designs. You are sure to find just what you want and at the right price. Mr. Spitler has built up a large trade which is ever expanding. His policy is one that is sure to draw and keep customers. That is, he sees that all purchasers are satisfied. There are no deceptive or alluring goods. They are sold on their merit and this is the keynote to the large patronage enjoyed by the Spitler store.